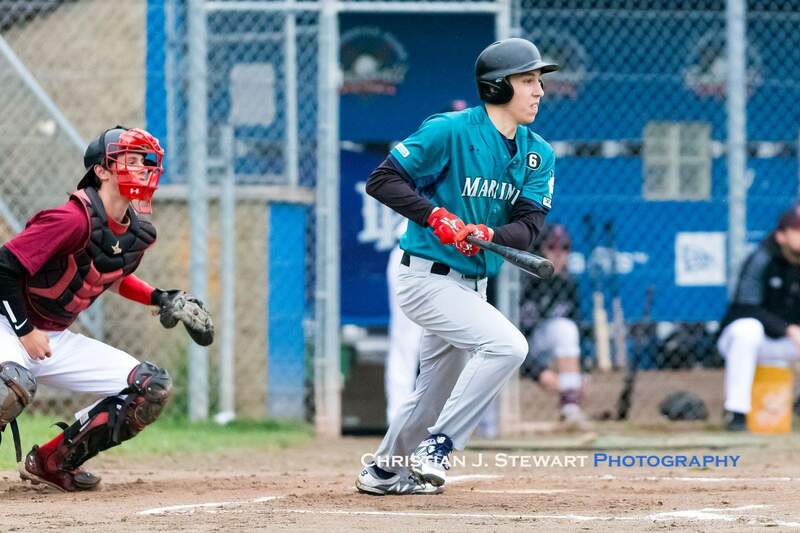 April 16, 2019, Victoria, BC – The Victoria Eagles used a five-run fourth inning to overcome a 5-4 Victoria Mariners lead and then hung on to defeat the Mariners 9-7 in B.C. Premier Baseball League (BCPBL) action Tuesday evening at Lambrick Park in Victoria. The game was the first BCPBL game of the season in the City of Victoria, as it was the home opener for the Eagles (2-1) – who split a pair of games on the road with White Rock last weekend – and the first game of the season for the Mariners (0-1), who had to postpone their first four scheduled league games of the year due to their participation in the Best of the West Tournament in Kamloops. The game was a see-saw affair through the first three innings, as the Mariners came out of the gate to score three first-inning runs off Eagles starter Leo Jansch, only to then watch the Eagles respond with two runs in their half of the first and single runs in the bottom of the second and third, to jump into a 4-3 lead. The Mariners would then get two more in the top of the fourth taking a 5-4 lead, but then the Eagles put five across in the bottom of the frame, thanks in part to RBI singles from Jordan Bond and Jayden Cull and an RBI double from Dylan Brown, to take a 9-4 lead and give the Eagles all the cushion they would need. The Mariners would score two more in the top of the sixth, loading the bases on Eagles reliever Chad Hegland and then getting a two-RBI single from Justin Giles, but that is all they could muster and Eagles closer Ardan Berg would strike out the side in the seventh to close out the Eagles win. After his shaky first inning, the Eagles’ Jansch would settle down to keep the Mariners off the board in the second and third, leaving the game after giving up five runs on six hits and six walks in his three innings of work. Kaleb Nantes, who would get credit for the win, would give up just one hit in his full inning of work, with Hegland giving up two runs on three hits and two walks in his two innings of work. For the Mariners, Trey Sjerven got the start, giving up three runs on five hits and one walk in just one full inning of work. Gabe Crozier, who was tagged with the loss, followed in relief, surrendering four runs on five hits. Rhys Hill and Aidan Heintz, who blanked the Eagles over the final two innings, also saw work in relief. Offensively, the Eagles’ 12-hit night was led by Brad Cox, Cull and Eric Luchies, who had a pair of hits each, including a double from Luchies. Alex Baan-Meiklejohn had a hit and pair of RBIs, with Brown contributing his RBI double in the fourth. Cull also scored three times for the Eagles. For the Mariners, Rei Kimura, Taine Clague and Kodai Yaoita led the way with a pair of hits each, with Josh Walker and Justin Giles contributing a pair of RBIs each in the losing effort. The Eagles will now get set for a busy weekend at home, as they host the Coquitlam Reds (0-0) for a pair of games Saturday and then host the league leading Mid-Island Pirates (4-0) in a double-header on Sunday. The Mariners have Saturday off but will host the Reds on Sunday at Layritz Park and then travel to Nanaimo on Easter Monday to take on the Pirates.